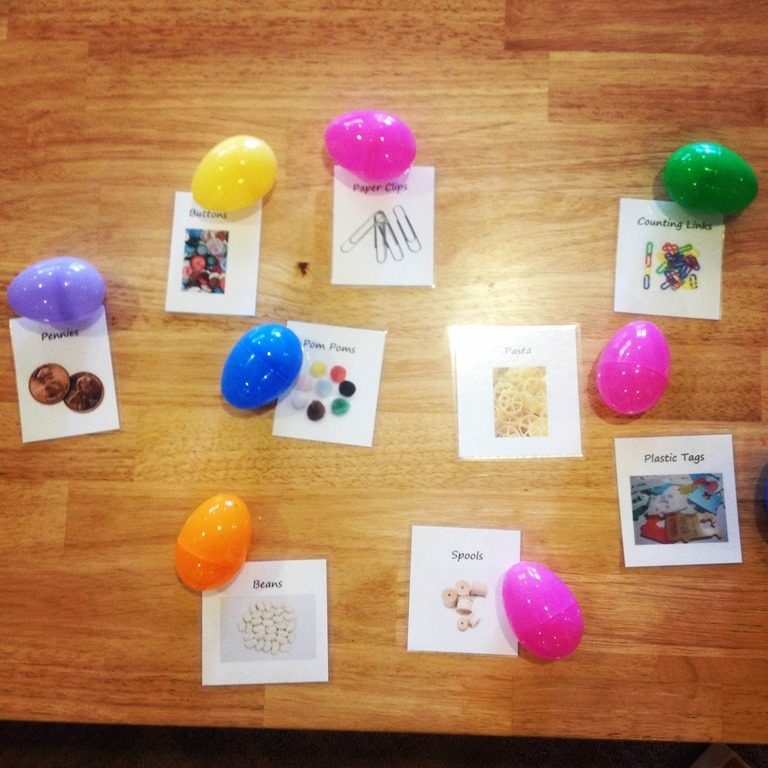 We had a great time incorporating some Easter themes into our days in April. Above is a picture of an activity we had out on the light panel. The children could crack open an egg, find the letter on the Handwriting Without Tears ABC chart. We have used this chart for various activities throughout the year, so the children are familiar with the organization of the letters. They enjoyed the cracking of the eggs as much as the letter hunt! One of the art invitation was an egg wrapping station with yarn and poster board egg shapes. I cut small slits on the edges of the eggs to allow the yarn to hook and wrap. Then I offered them a variety of colors and scissors for each child to switch colors during their wrapping. 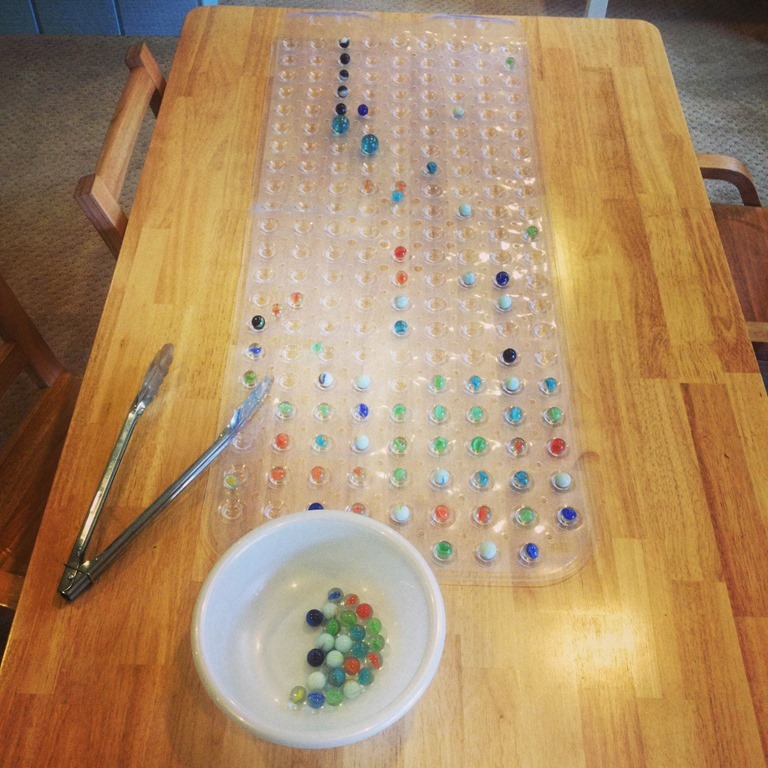 This project encouraged the development of hand-eye coordination. I made a little “Chick Village” play tray for the children. They could use the paint brushes to sweep the rice for the chickens, or move the rice to different areas of the tray. The little wooden frame provided a house area for the Mama and baby chicks to live. This was a simple set up that provided lots of open ended play. 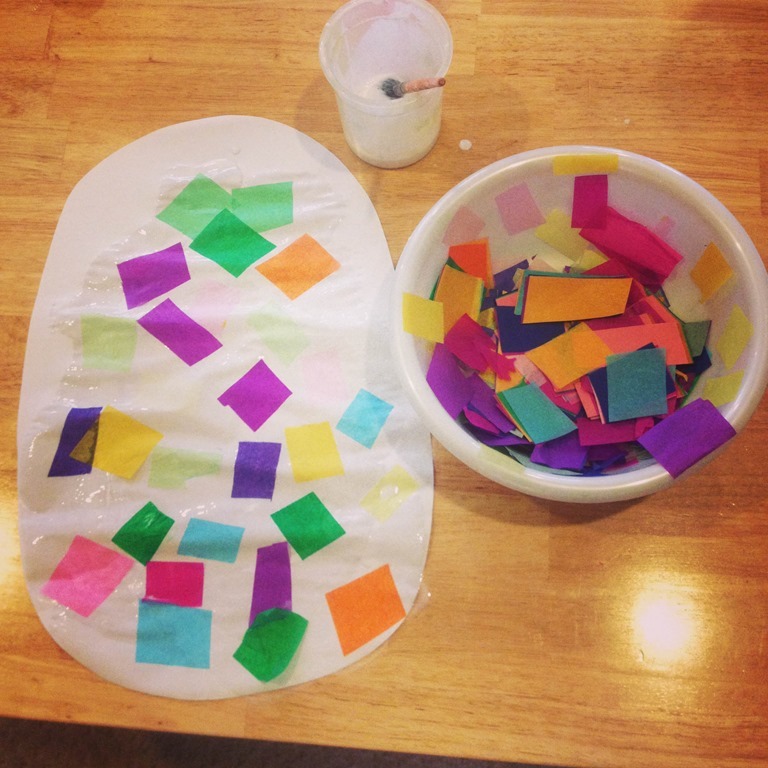 We also had a beautiful batch of yellow dough that we added many Easter themed materials to go with it! The children had cookie cutters, spring gems with flowers, carrot eggs and much more. They were very creative with their play dough creations! Egg decorating is one of my favorite activities! I love to try different techniques each year, and the children are always up for a creative way to sue the art supplies. The first technique we tried was shaving cream and watercolors. I will admit this technique was a bit of a bust. The best eggs were in the first batch. They truly had a very marbled look to them, but as the children continued to mix the eggs in the cream they lost their marbled look. This would be a good technique if you just had one or two kids that were dying, but it didn’t lend itself to many kids in the classroom. Although the puffy shaving cream is always a hit! The second day we tried a new technique of dripping watercolors onto the eggs. They turned out beautiful! These turned out so bright vibrant! 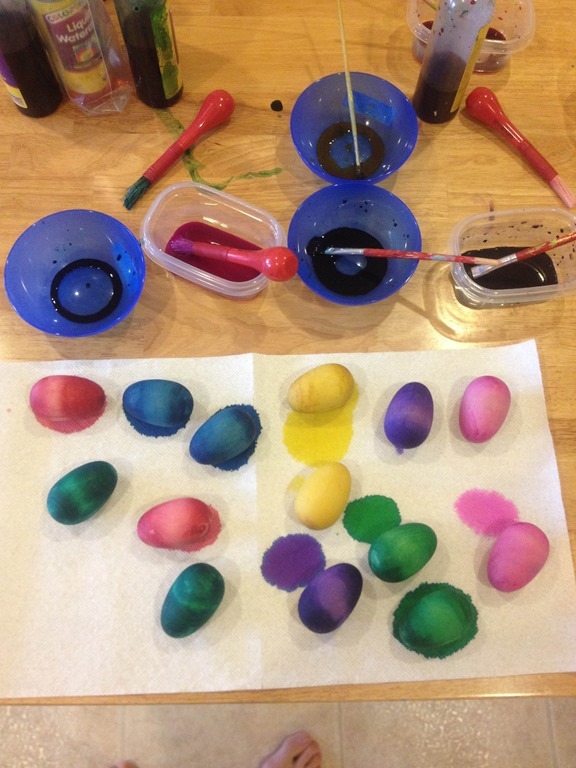 I loved the colors and how they popped on the egg shells! Squeezing and squirting the liquid watercolors is always a satisfying process for the children too. 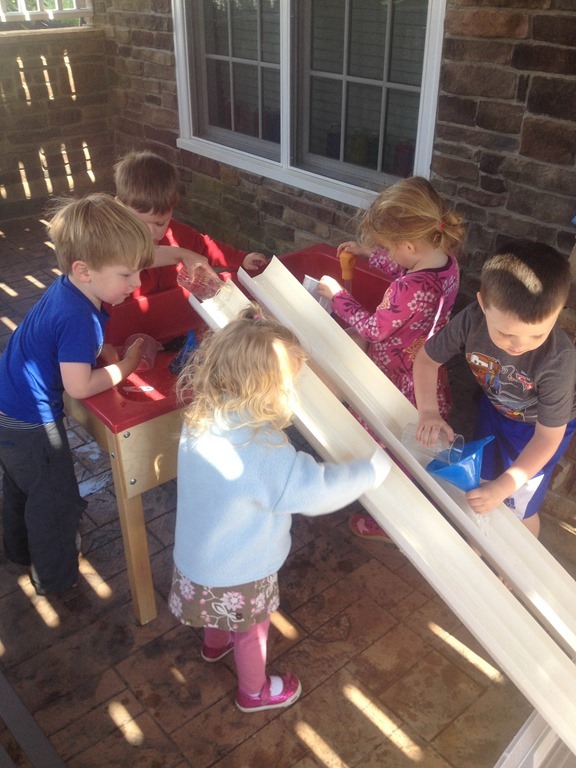 The children had so much fun with the shaving cream, I wanted to do another project with it! We used the shaving cream to create a marbled technique on card stock! First I made a layer of shaving cream on tin foil. Then the children picked the colors they wanted to use to drip acrylic paint onto the shaving cream. After they swirled the paint in the cream, we pressed the card stock onto the cream. After it sat on the card stock for a few minutes we scraped it off! The results were just wonderful! Unfortunately, I completely forgot to get a picture of the final product:( I know the kids and parents loved them! On a whim I purchased a bunch of paper mache type eggs at Walmart. 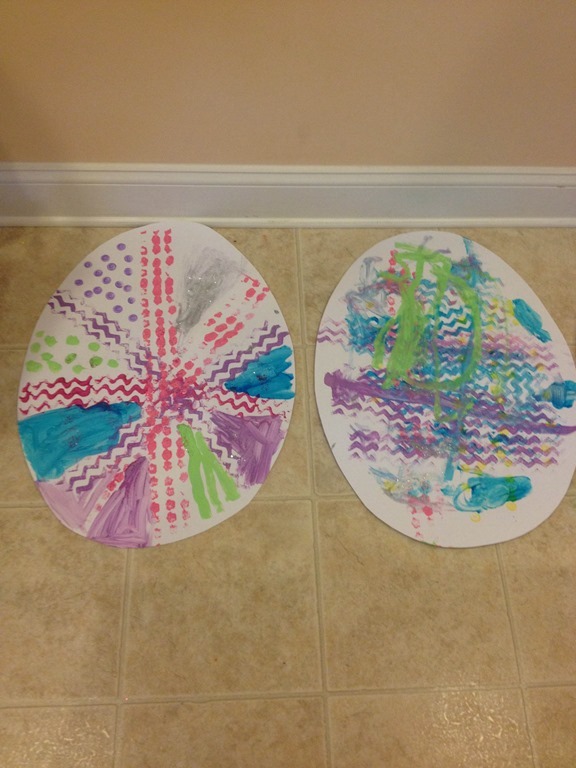 Then we added sharpies, washi tape, and scissors to wrap, cut and decorate the eggs. 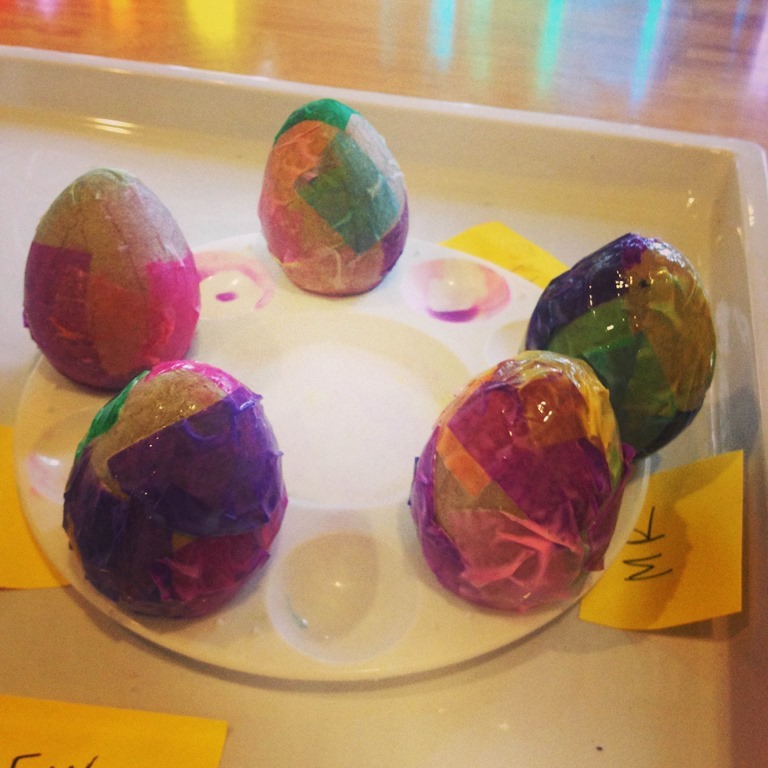 This was one of the most popular activities, and the children created many eggs throughout the week. I am sometimes surprised how the simple things are the most fun for the group. We ended all of our Eggstra Fun with a giant Egg Hunt outside! Thank you to all of the parents for supplying eggs that were filled with fun treats and surprises! 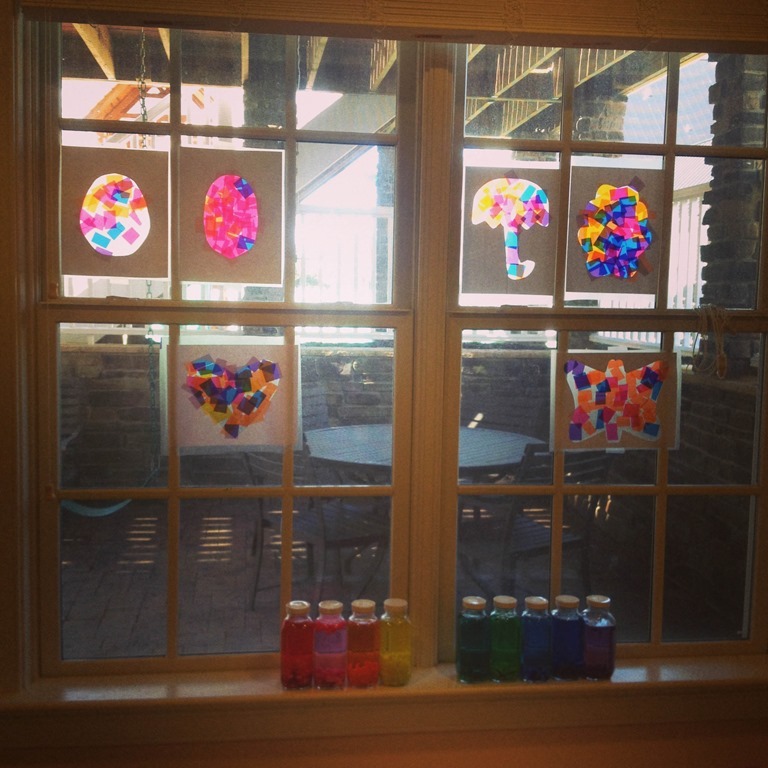 Categories: preschool, reggio emilia inspired | Tags: easter, easter egg hunt, eggs, play dough, process art, shaving cream art | Permalink. Our bird study blended right into a big discussion all about “eggs”. We talked about eggs, we painted eggs, we played with eggs, and of course there was some discussion of the Easter bunny too! R joined our class for the last few months of school, and she has blended right in with the group perfectly! She is full of excitement, and art projects seem to be her passion right now. 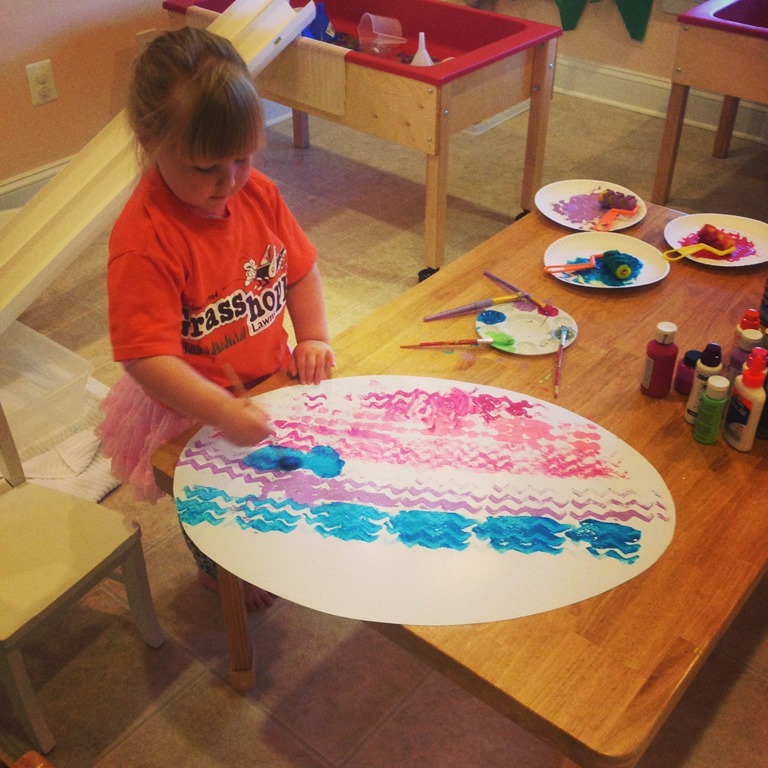 She enjoyed this contact paper project I presented on the easel. I cut out shapes and provided the outline along with cellophane paper to fill in the shape. The result was just beautiful in the art room. 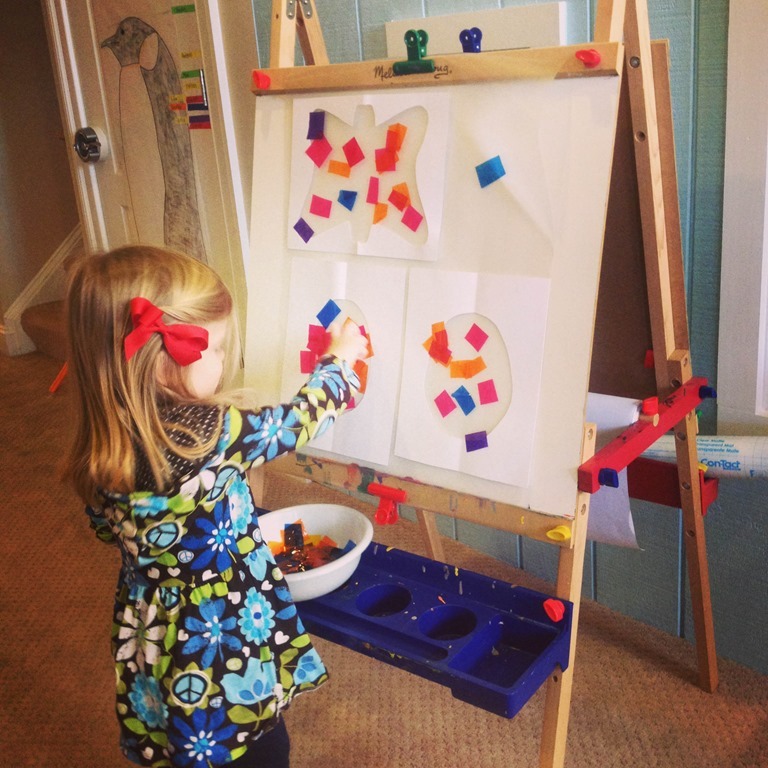 This art project is great for fine motor development, and using an easel for preschool art actually has many benefits. Another wonderful blog that I read frequently, Small Potatoes, describes 5 wonderful benefits of easel art in this blog post. 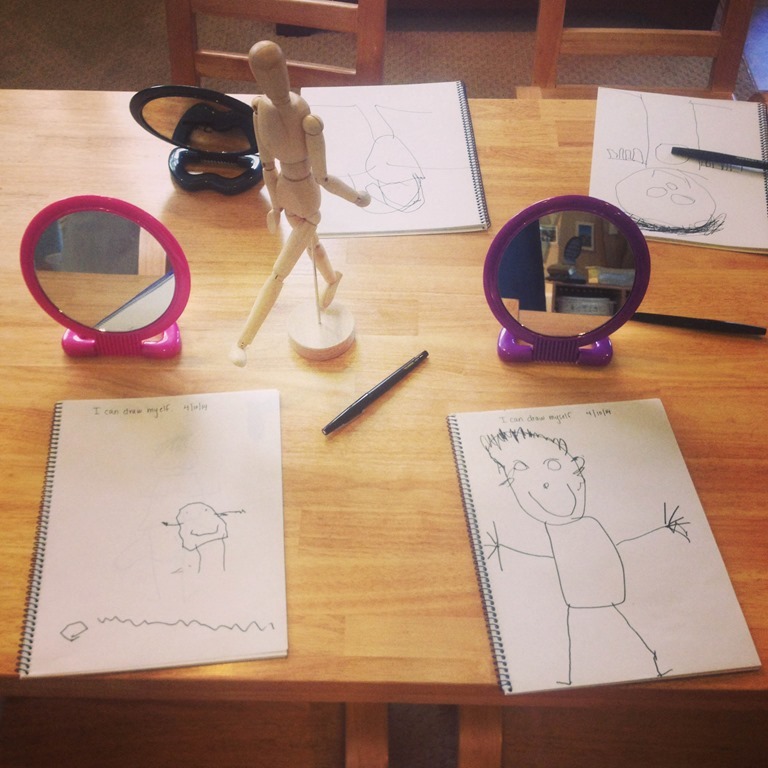 This blog is a wonderful resource for play tips, sensory activities, and art inspiration at home. One week children found this on the classroom tables. These are actually little drink glasses from the dollar store. I turned them upside down and wrote upper case and lower case letters on the glasses. 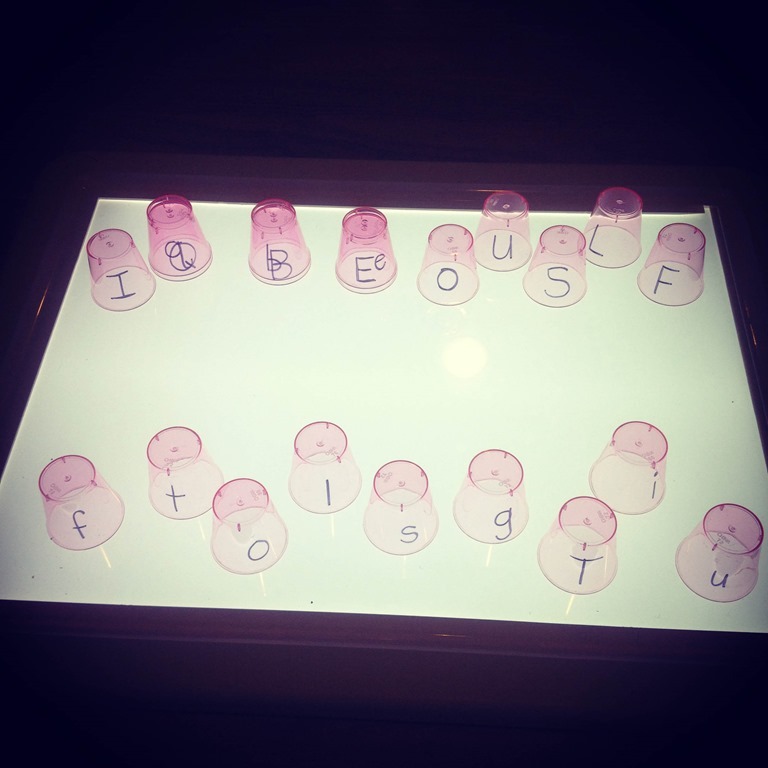 Children matched the lower case letter to the uppercase letter on the light table. I love providing unique materials that engage the kids in new ways. This is a long bath mat turned upside down. 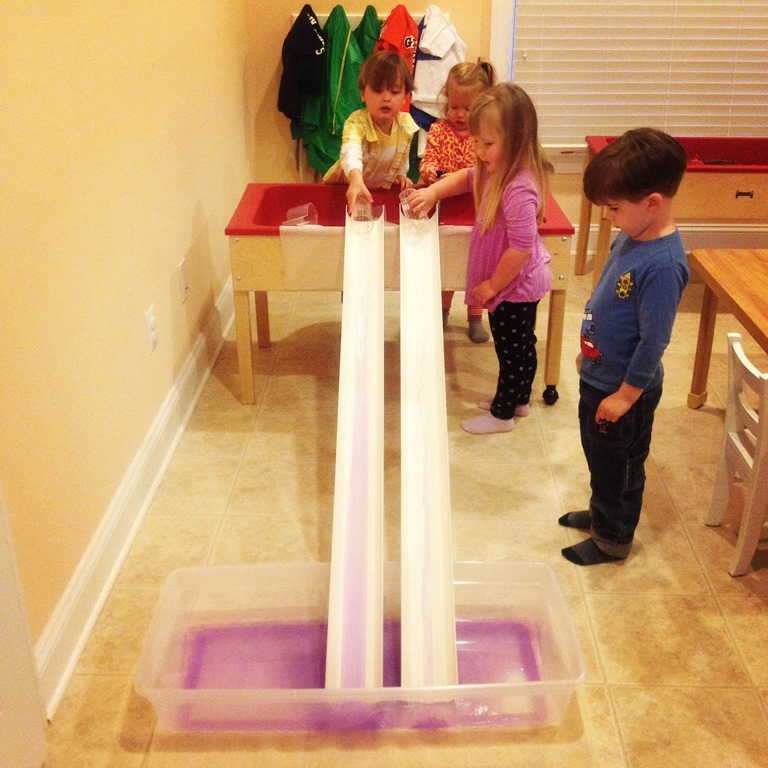 Children had to use the tongs to move the marbles from the bowl to balance on the suction cups of the bath mat! 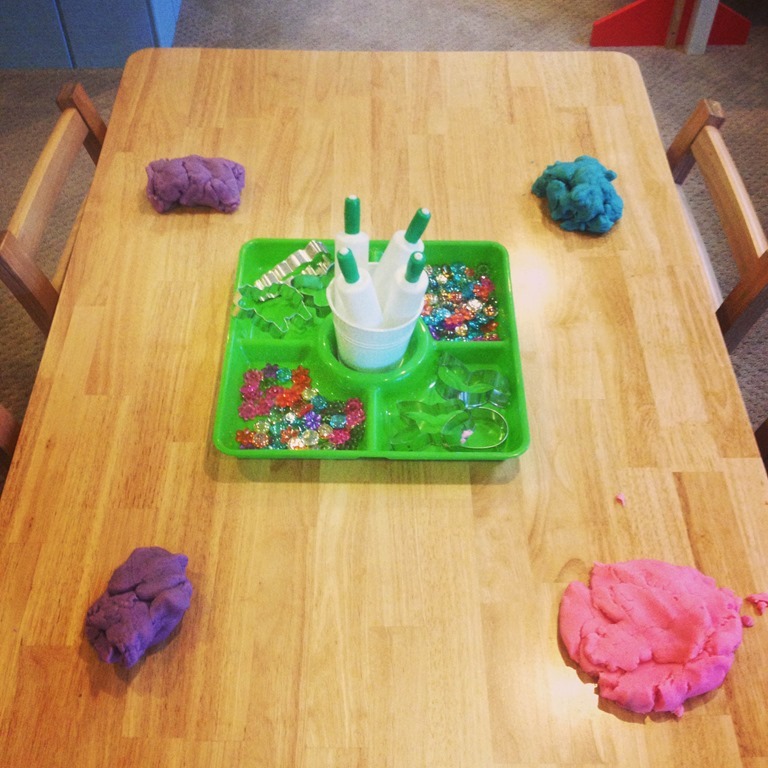 We explored some lovely spring colors with our play dough last month! I made a large batch and then split it into purple, pink and blue. On the play dough tray I provided spring gems in bright colors, flower gems, and then an assortment of cookie cutters including sheep, bunnies, and eggs. Our learning trays this month have been filled with all sorts of different interests. The picture above shows a counting tray I created. 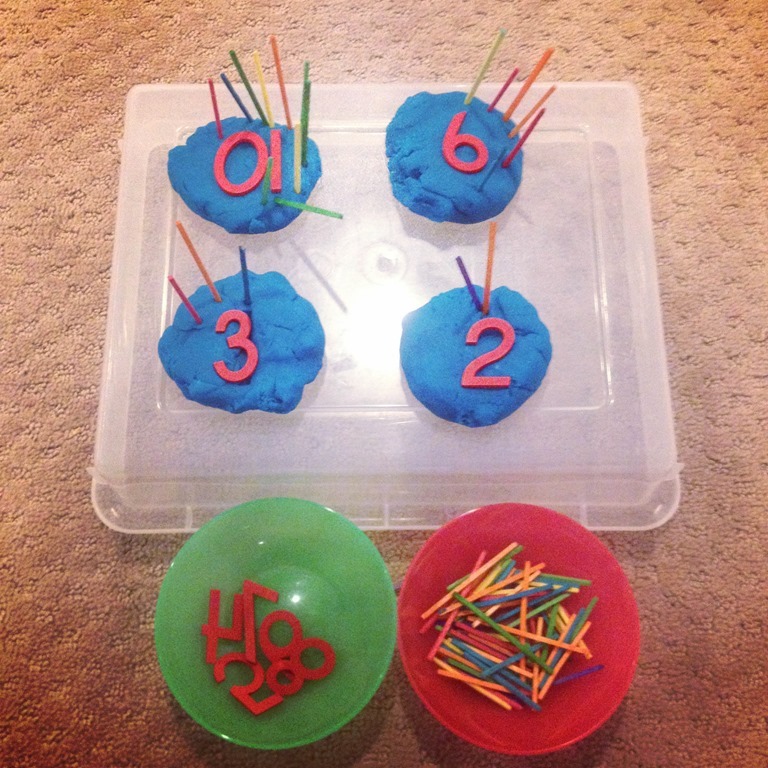 Using small play dough cakes, I would place a number in the play dough and the child would match the correct number of matchsticks to the number. This was a fun egg and sound guessing game. 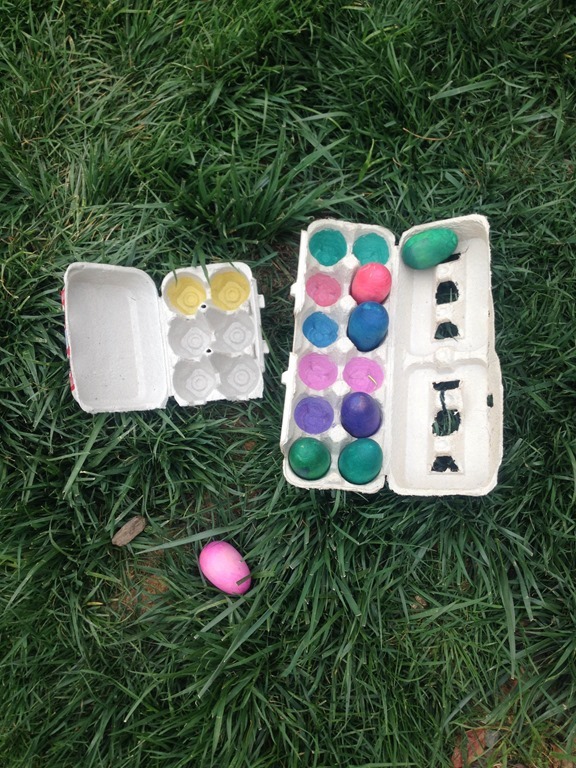 I filled plastic eggs with different loose parts from around the house. The child would shake the egg and try to guess what was inside based on the sound of the egg. Some of the items were easy to distinguish like the pennies and paper clips, and some were more difficult like the plastic tags and links. 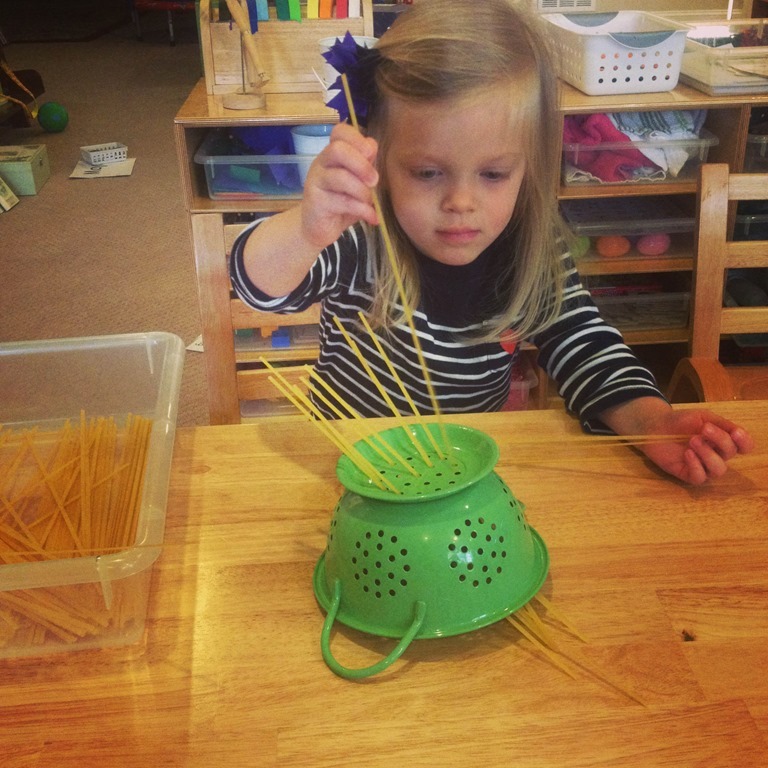 R is exploring a learning tray of fettuccini pasta and a small colander. 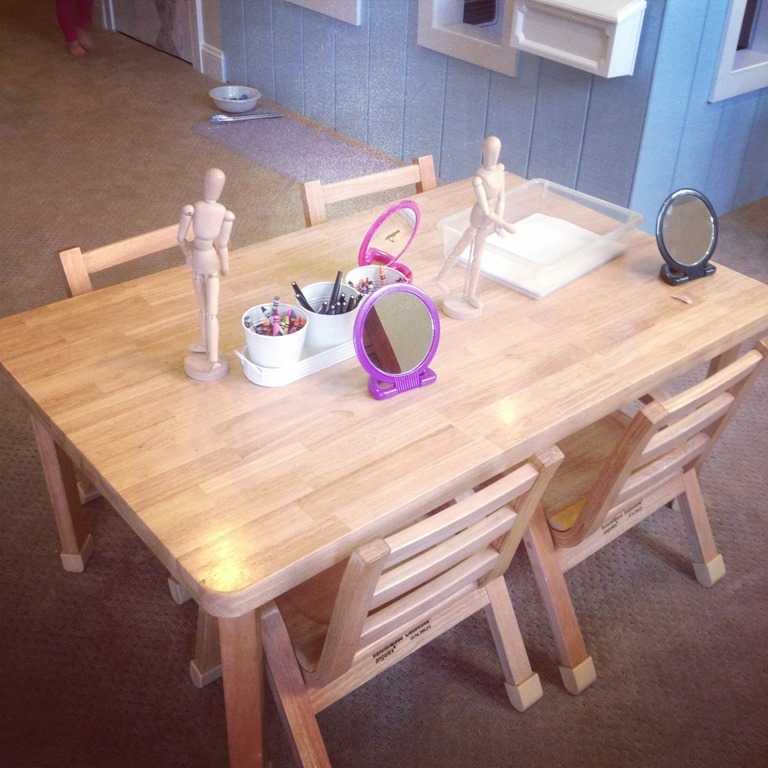 This would be a quick and easy exploration to set up while you are trying to cook dinner! 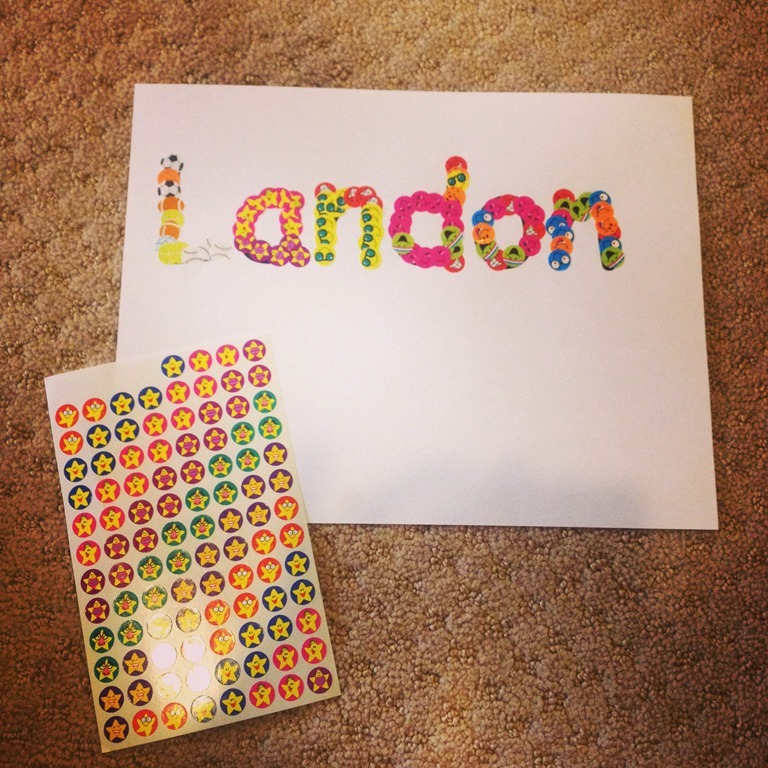 I printed out each child’s name and they placed an assortment of stickers overtop of their letters. It was great fine motor and letter practice! We played with this learning tray a few times as a whole class, and then I put in on the shelf for individual exploration. Each child would crack open an egg to find a letter inside. Then they matched their letter to the ABC sheet provided. 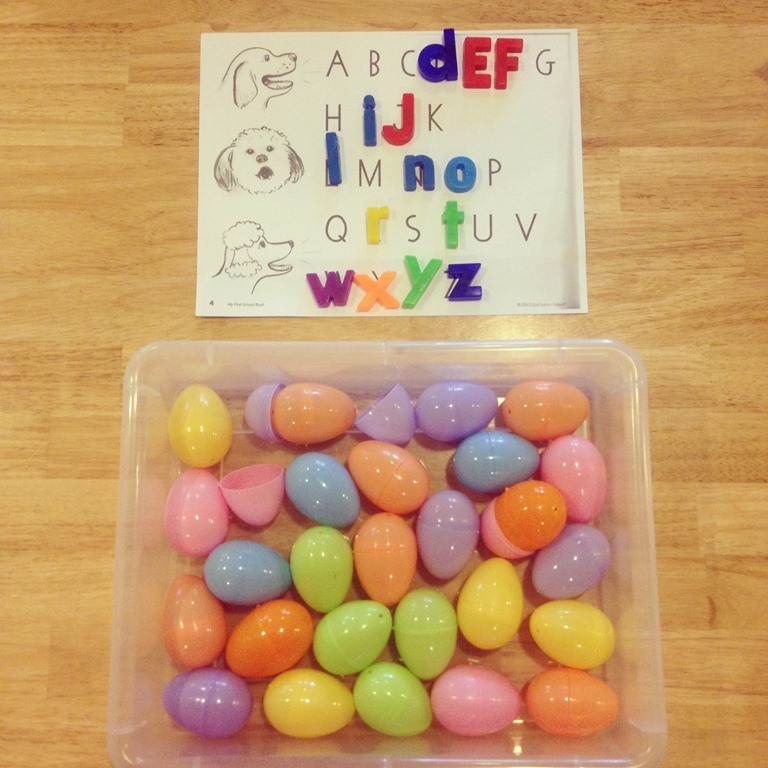 Just adding the opening of the egg created so much excitement to a simple letter puzzle! 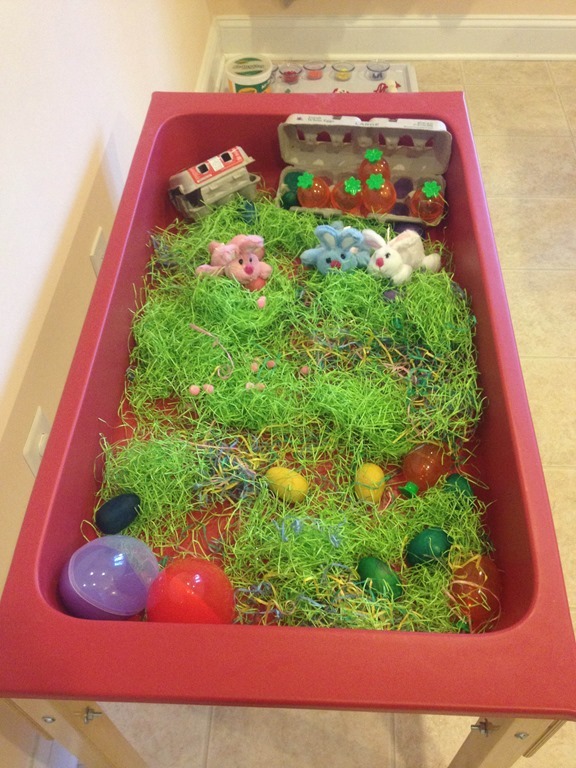 Our Easter Sensory Bin: green Easter grass, eggs large and small, bunnies, and carrots. 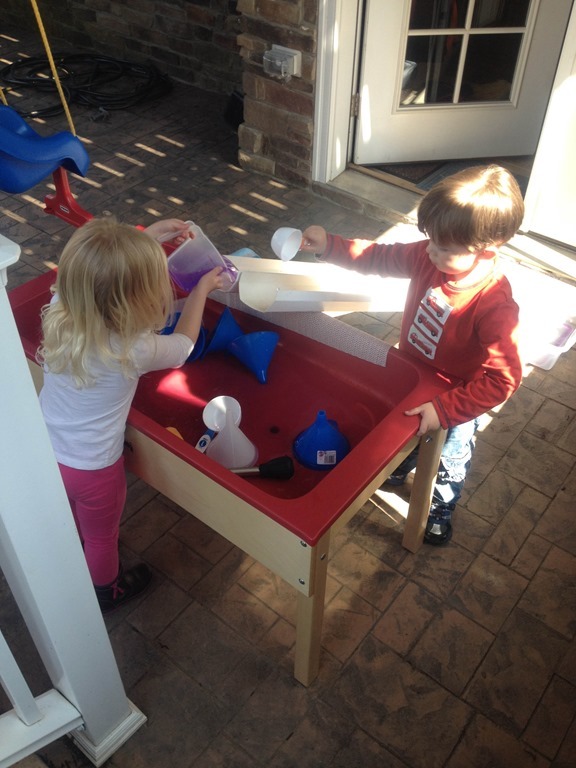 This water sensory tub was a huge hit for most of the week! I created it using the liquid watercolors, gutters cut in half, a second tub to catch water, funnels and cups. They loved watching the water splash, move, and fill up again and again. In the picture above M and L are pouring the water while L is entranced by it sliding down the gutters! Both age groups were super involved with this water activity. It will be repeated again I am sure! 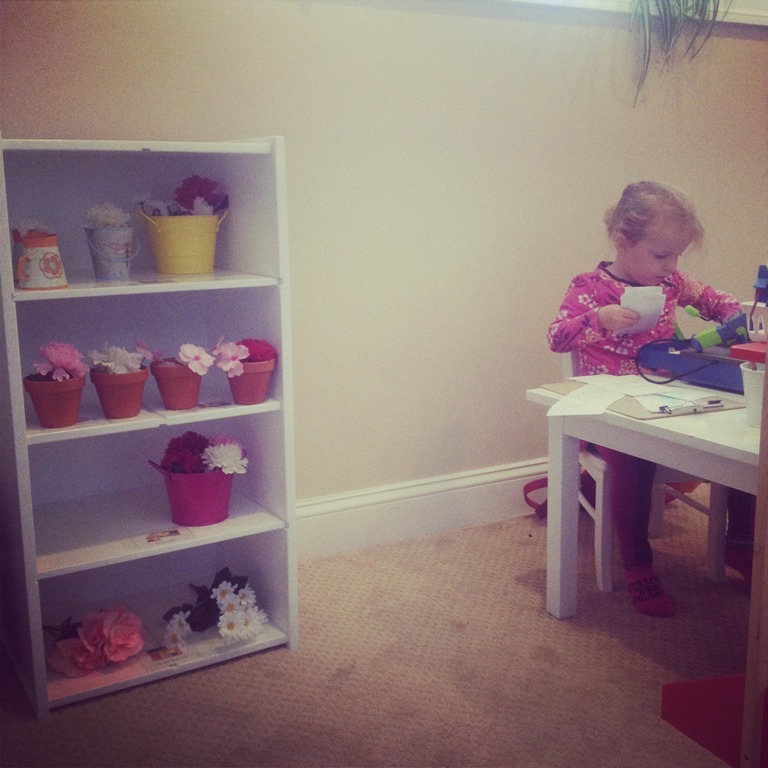 For some wonderful spring themed dramatic play I created a “Flower Shop” for the kids. I provided a shelf filled with cups, pots, and loose flowers, a store front, cash register, money, paper and pens for note taking. 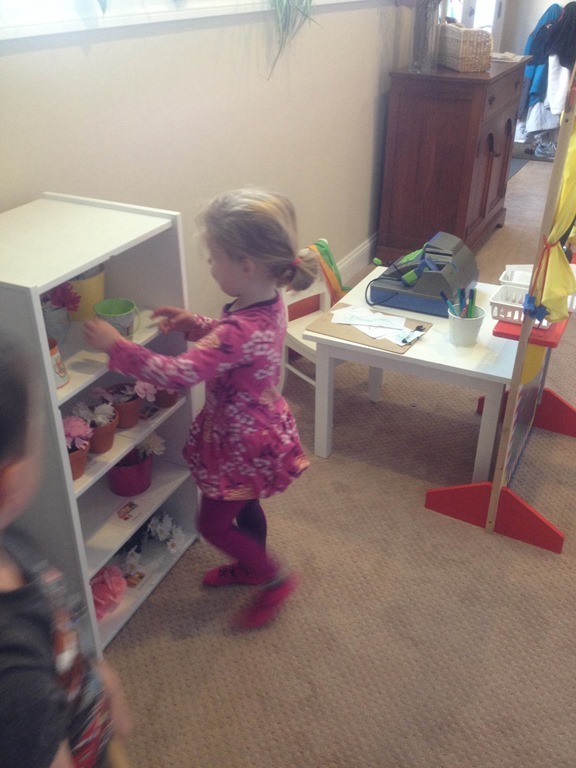 This was a busy flower shop, and the children enjoyed making flower arrangements for each other. This past month the children created a wonderful group art project using a very large sheet of contact paper. I laid the paper out on the table and provided lots of spring colors to stick anyplace they wanted. The results were so pretty, and I love seeing it hanging on our doorway everyday. 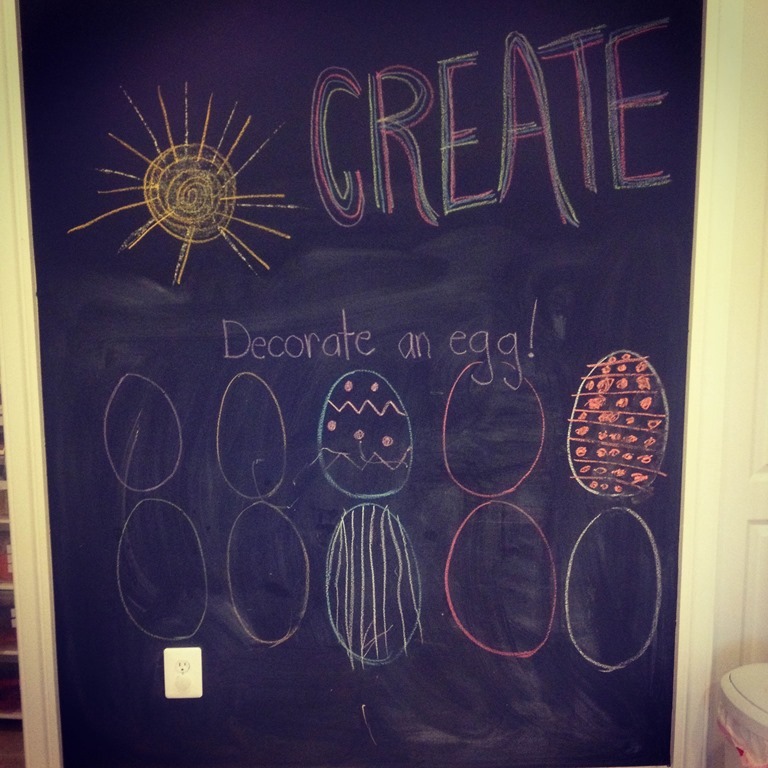 I drew a bunch of blank eggs on the chalk board wall and waited to see if they would fill in the eggs with different designs! One of my favorite projects this past month was a super sized egg! 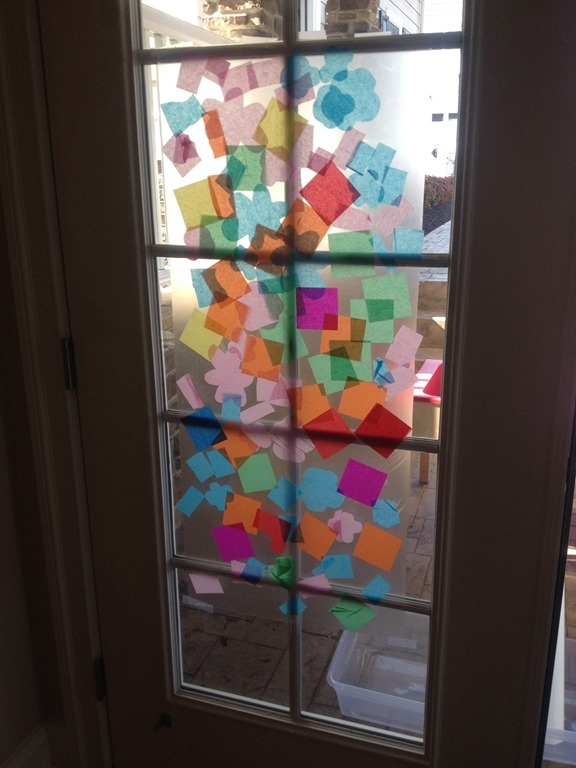 I got the idea from Fun at Home With Kids’ blog about a big Easter Egg. I changed our eggs slightly and provided the textured rolling pins for the students to make large scale designs for their eggs. Here is L in the middle of making her Very Large Egg! We paper mached paper eggs with tissue paper and modge podge! I had so much extra tissue paper we used some to do some bleeding tissue paper art work! 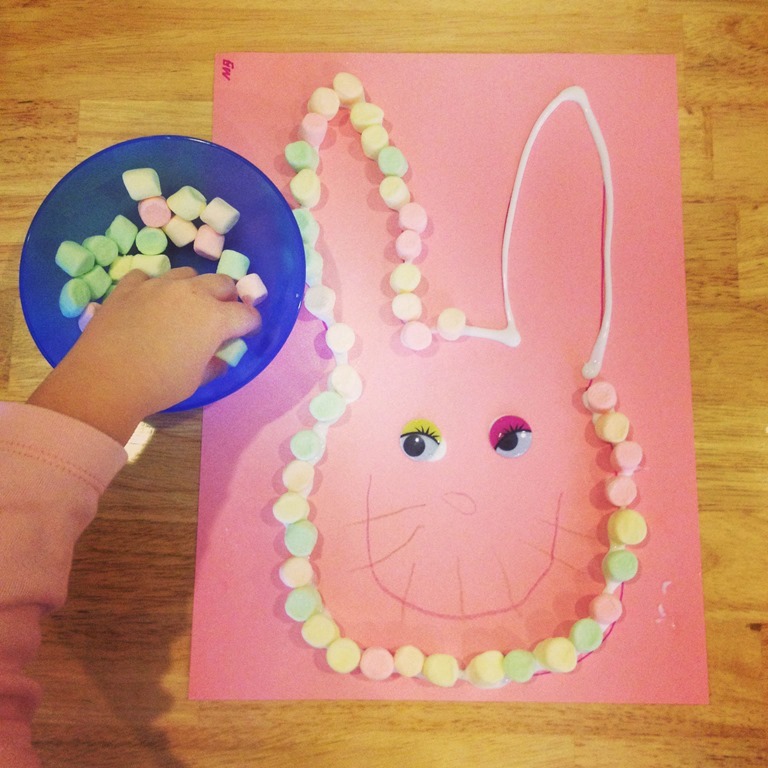 And just for fun we made Easter bunnies using Easter colored marshmallows. They got to eat a few marshmallows when they finished their bunny too! That just about covers all of our “Egg”stravagant Spring exploring! Categories: education, home based learning, home based preschool, home preschool, preschool, process art, sensory play | Tags: easter, eggs, fine motor, fine motor skills, holidays, learning trays, learnning through play, play based learning, play based preschool, play dough, preschool crafts, pretend play, process art, sensory bins, sensory play, spring, spring themes | Permalink.